Ergonomics As expected. Read text. The post merger years saw a lot of activity at Zeiss Ikon, from a continuation of models from the pre-merger companies to some new cameras. The Ikonette was one of three cameras to share this name, with the last being a 35mm camera from the 1950s. The first Ikonettes were released in the same period and are for the most part are the same camera with a couple of minor differences. I will present them as just one camera and then explain the differences near the end. The Ikonette is a simple folding camera of modest specifications - it's a phrase that you'll encounter occasionally with classic cameras and it holds true with the Ikonette, which uses Kodak's VP 127 film. The Ikonette was introduced in 1929 and remained in the catalog until 1931. 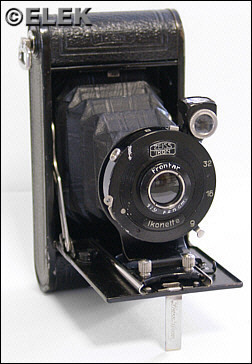 The Ikonette was one of the first Zeiss Ikon cameras, but definitely not the last, to use the Goerz Frontar lens. The uncoated 8cm Goerz Front achromat (two cemented lens elements) sits in front of a simple shutter with two speeds: B and M (momentary). I would guess a moment in time in the late 1920s to be about 1/25 of a second. The camera has three apertures: f/9, f/16 and f/32. The three apertures are holes drilled in a single metal plate (which was then painted black) that sits behind the lens. The photographer sets the aperture by moving a lever on the outside of the shutter housing. The Ikonette features a drop bed. The lens sits at the end of leather-covered bellows. Lift the tab on the lens door and pull open the door and lock it into place. Grasp the two small posts under the lens/shutter housing and pull the lens out on the chromed rails. There are two distance settings: Infinity and two meters (approximately 6 feet), which presumably is for portraits. Push the tab on the distance scale toward the rails, and you can pull the lens to the closeup setting. Frame your shot in the tiny waist-level brilliant finder. By cradling the camera carefully but securely in both hands, the thumb of your right hand is at the perfect position to trip the shutter. Don't push too hard or too quickly and keep your fingers away from the lens. By default, the camera is set up for a portrait photo. The finder can be rotated 90 degrees clockwise if you want to take a landscape shot. However, the shutter release is now in a somewhat awkward position under the lens. A small cable release will come in handy. In fact, a cable release is a nice accessory for either orientation, because it gives you better control when you trip the shutter. To close the camera, push the lens and bellows back into the body. Press on the chromed struts near the body and the lens bed can now be closed. The small tab that allows the camera to sit upright on a table doubles as the latch for the lens door. Lift the tab away from the body, push the door into place and secure it by pushing it flat against the door. When closed the camera is very compact and personifies the "vest pocket" theme. The photos were very nice, a bit of a surprise considering my previous experiences with uncoated Frontars on the Box-Tengor. Contrast and sharpness were good, although with this camera, infinity focus is reached when the bellows are pulled slightly beyond infinity. My Zeiss Ikon book shows two nearly identical cameras: a regular Ikonette and a "ladies" version. The regular Ikonette bears no Zeiss Ikon number, while the "ladies" model is marked as 504/12. While the regular Ikonette was covered with leatherette, the "ladies" version had "black leathercloth." And that appears to be the only differences. I believe that I have the regular Ikonette. Both appeared on the market in 1929 and were in the Zeiss Ikon catalog until 1931.